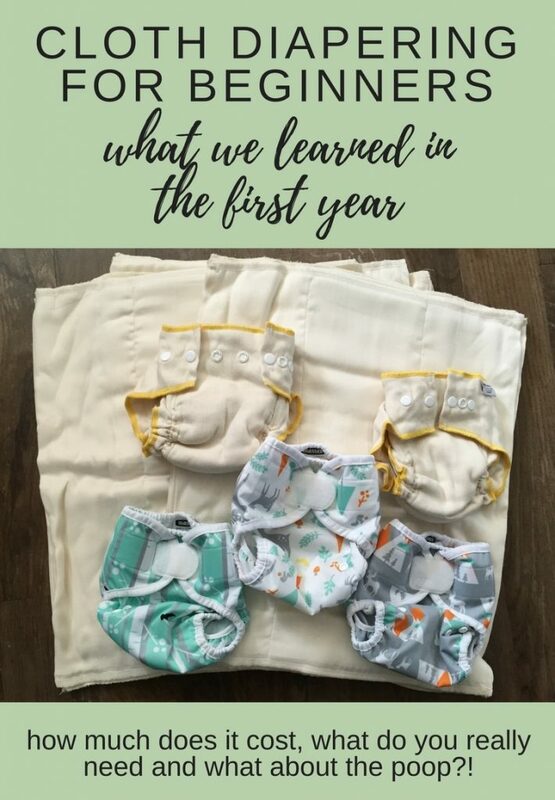 Cloth diapering for beginners – what we learned in our first year. How to start, what it costs, what you need and what to do about the poop. Now that we have officially been cloth diapering our son, Atlas, for over a year I wanted to share everything that I’ve learned. When you first start doing research on cloth diapering it’s just SO OVERWHELMING. I remember getting frustrated/confused and giving up several times. There are just so many types, styles, price points and opinions. The first thing you want to do is just figure out WHY you’re cloth diapering. It’s most likely one of two reasons: it’s cheaper or it’s better for the environment. We are actually cloth diapering for both reasons. Our mission was to save money and we are always trying to reduce how much waste we produce. But once you know why you can kind of narrow down your options. We knew we weren’t going to spend $30 a diaper because that wasn’t affordable for us. In our first year of cloth diapering we saved over $600 and over 2000 diapers from the landfill! The goal of this post is to give you some pointers from someone with a little experience, but was a cloth diaper novice not that long ago. Please note: this post contains affiliate links and I make a small commission if you purchase through those links. This does not cost you extra and you are definitely not required to do so. However, I do my best to provide helpful information on products I genuinely recommend and I appreciate the support! I was so surprised at how people reacted when I mentioned that we would be cloth diapering! I has several people try to tell me I wouldn’t be able to handle it and try to talk me out of it. Guess what, it’s really not that hard. We were committed to it from the beginning and while it is a little extra work, the money saved and the fact that I’m not throwing away dozens of diapers each week is worth it. It doesn’t have to be expensive to start! There’s a common misconception that it’s really expensive to start cloth diapering. While it is a little more expensive up front than buying a pack of disposables, it doesn’t take long for you to even out. Just start small of even try buying used. It sounds scary, but as long as you buy diapers that are in good condition and clean them it’ll be fine. When you do your research you’re going to see all sorts of fancy things that you think you’ll need to start cloth diapering. Try to hold back and remember just two things you need to start: diapers and laundry detergent. That’s literally the bare minimum and you can get by with that for quite a while. People would argue that you need a pail liner, but you can get by without one. If you have an empty trash can or some other place you throw the dirty diapers it’s nice to be able to line it with a pail liner and just throw it in the wash, but if you can’t afford one right away all you have to do is clean and disinfect it while your diapers are in the wash.
Like I said above, pail liners aren’t a total necessity, but they are so helpful. I just pull the pail liner full of diapers out of the trash can we use and then throw it in the wash with the diapers. Since you’ll still be using diapers while you’re washing I recommend getting two pail liners. We have 2 pail liners similar to these with elastic around the opening that we just put in small trash cans. If you don’t want to use trash cans and would rather maybe hang a bag on the door you can also get a large wet bag! Because newborns go through a lot of diapers, my favorite for them is to just use prefolds folded and laid inside of a diaper cover. One of my favorite places for prefolds is Green Mountain Diapers. They are affordable and great quality. If you’re just getting started with a newborn a couple dozen of their Clotheez “Newborn” (orange edge) prefolds and some X-Small Thirsties Hook and Loop (velcro) covers would be a great way to start! At the time of this post if you got 2 dozen (24) of the Clotheez Newborn prefolds and 5 Thirsties X-Small covers it would only cost you $107.50 to start. With this size stash you’d have to do a load of diapers every 2-3 days which is as long as I like to wait even when I have more diapers. We also personally used Osocozy prefolds and Rumparooz covers which worked nicely too, you can see them linked below. When you’re first starting and your baby is teeny tiny, I recommend going with velcro (also called hook and loop). Velcro for tiny babies is best because it will fit them exactly right where as with snaps it’ll almost always be too loose or too tight. Once they chunk up a bit then snaps work just fine and won’t wear out as fast. If you look up Youtube videos of cloth diapers you will see huge stashes! You really don’t need that many diapers. Right now my son is 1 and we have about 20 diapers and we could honestly get by with less. Since newborns tend to go to the bathroom a lot and their skin is more delicate you need to change them every 2 hours so they go through diapers much faster, but that’s why I love prefolds with covers because unless the cover gets really messy you can just change out the prefold and reuse the cover. One thing I read is that if you’re using prefolds or flat diapers, they aren’t nicely lined with a soft fleece like all in ones are. So to make things a bit more comfy, and to help wick away moisture to prevent rashes, I just go a cheap fleece blanket and cut up a bunch of little liners that I put between the baby and the diaper. Breastmilk poop is washing machine safe! If you’re formula feeding or your baby is eating solids you’ll need to deal with poop, but when you’re exclusively breastfeeding you don’t have to do anything but throw that poop diaper into the pail to wash. Breastmilk poop is water soluble so it all dissolves and washes out nicely in the washing machine. Just throw the poopy diaper in the wash and you’re good to go, no spraying or wiping necessary. I spent a lot of time researching how to store diapers, but once I got them into my house it was pretty simple. Our diapering station was on the dresser in our bedroom. We had a basket laying on it’s side with diapers stacked inside (see photo above) along with some extras in the drawer right below that. Since we already went over the fact that you don’t need a huge stash you really won’t have to figure out that much storage. There were a few times in the first few months where I was too lazy to wash the diapers and ended up having to use disposables. While I’m totally fine with falling back on disposables when needed, life got much easier when I fell into a routine. Now I have a small trash can with a pail liner and as soon as that’s full I do a load of diaper laundry. The pail fits about half our stash in it so we always have enough left to get through the wash routine plus the day or two I procrastinate pulling them out of the dryer. If you do have hard water, make sure you’re using a water softener or else minerals will deposit on your diapers making them smell after a while. If this happens you can strip and bleach them, but to avoid this in the first place make sure you have a proper wash routine. A good place to find out the best wash routine for you is Fluff Love University. Right now my wash routine consists of a prewash with borax and a little detergent, a main wash with borax and a lot of detergent and then drying either on a clothesline or in the dryer on low. One thing I didn’t consider at first is that I needed to bulk my washer and not just wash cloth so that there was friction and agitation to get the diapers clean. How I do it is I do the prewash cycle with just dirty diapers and then for the main wash the diapers are mostly clean so I throw in small items like baby clothes or dish towels, etc. This also makes it so I constantly have clean baby clothes which is nice! If you’re breastfeeding you will likely get some staining and the best way to get these stains out is to sun the diapers. Just leave them in the sun on a clothesline or even just on a table (with something holding it down so it doesn’t blow away). It wasn’t 100% effective every time, but this method always got a . In addition to sunning your stains, if you line dry your diapers they will last longer! I actually love line drying our diapers. They do get a little more stiff so after line drying them I’d throw them in the dryer for maybe 5-10 minutes to soften them up. Once my son got a bit older and the volume of urine increased we had a lot of trouble at night! It took us probably a month of nightly leaking and trying different things to figure out what worked at night. Disposables sometimes worked, but we didn’t want to go that route permanently. Our go to is Green Mountain Diaper Workhorse fitted diapers + Thirsties hemp insert + a cover (Thirsties covers works well). I think the reason this works so well is that there’s a lot of absorption from the fitted diaper and the insert, but also because the fitted diaper has elastic around the legs on top of the elastic around the legs on the cover, it’s doubly protected from leaks. This method rarely ever leaks for us! There are good and bad points to this. The good part is that once they start eating a good amount of solids you’ll have to change less diapers because they aren’t peeing as much. The bad part is you’ll have to deal with poop. We went from diaper changes every 2-3 hours to more like every 4, sometimes 5 hours. Poop doesn’t have to be scary! At first we thought we were golden because my sons poop was nice and neat and easy to plop into the toilet before throwing the diaper in the diaper pail. But then things started getting messy and we had never invested in a sprayer. Everyone says you need a sprayer, but there are alternatives. We actually have a shower right next to our toilet. The shower head is removable and reaches the toilet so we are able to use that to spray and we’ve talked about replacing the shower head with something more powerful. That being said, you might want to get a spray pal splatter shield too. You can clip the diaper to it and spray inside the spray pal to prevent splashing. I’ve actually heard of people making these themselves out of cheap trash cans where they just cut out the bottom, if you’re looking for a budget friendly option. Another option is flushable diaper liners. I felt guilty about these at first, but honestly I was spending so much time and water getting poop off that I’m not sure using a gallon or more of water to spray a poop diaper is worse than a super thin liner. You just put the liner on between the baby and the diaper and if they poop you just pick up the liner and throw it in the toilet. We were able to use cloth at home and while we were out for a while, but when my son got bigger and was still on a bottle we had a lot of issues with leaking, especially in his carseat. So we just switched to disposables when we’re out. I do feel super guilty about it, but for us it’s important to do our best within reason. If you can use cloth 24/7 and not even own disposables then you are a rockstar. If not, that’s ok too! Since cloth diapers are a little more bulky it’s truly easier to just not put pants on your baby unless you need to. Otherwise make sure you size up their bottoms to account for the extra fluff. At home my son just doesn’t wear pants and if he does we put him in super stretchy pants. Plus, cloth diapers are adorable and I like seeing the prints anyway so it’s a win win. I was excited when I learned this because it makes cloth diapers even more affordable if you can recoup some of your cost after the fact. As of now (my son is 17 months old) I think we’ve spent $300-$400 on cloth diapers and I’ve already resold some of his smaller diapers for around $100. The stash we have now would probably get us close to $150 once we’re done. So keep in mind that you can throw them on ebay or one of the diaper swap facebook groups when you’re done. Some of my favorite resources for cloth diapering are in Facebook groups.